I did it, I finally stepped up into the world of YouTube! I have been watching all my fave YouTubers for nearly a year now, but never really thought of making my own videos. For a start, my voice is really childish, so I literally sound about 12! I find the whole "talking to myself/into a camera" thing really awkward and cringey, but i'm certainly gonna give it a go! So far i've filmed a bedroom tour, an OOTD for this outfit, and tomorrow i'll upload my daily make-up routine video. EDIT: I did create a new channel to share with my friend but because of problems linking the account to Google & Blogger, i've decided to stay on my own personal channel. 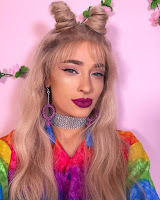 I'll still be making videos with my friend but will be using my channel LULUTRIXABELLEx to post them. We'll be making fashion videos together including charity shop/car boot sale hauls, OOTDs, "come shopping with us" and "how to style" videos, etc etc etc. It's all very exciting (and time consuming) but who knows where it will take me! Today's outfit was pretty casual, I wanted to wear my new creepers which match perfectly with my Lime Crime lipstick that the lovely Sheree from Glitz & Grime sent me! Isn't she the cutest? I've had this chainmail vest for aaaaaaaaaaages and it's never been worn, so I thought i'd give it some love today. Anyway, it's midnight and i'm tired, so better get off to bed. Remember to enter my giveaway to win a vintage bag, and pleeeeeease vote for me in the Cosmo Blog Awards! I know I keep going on about it but I would be eternally grateful if you do! I just bought a lipstick that colour today, it looks beaut on you :) That body chain is AMAZING, I Didn't realise it was a piece of jewellery at first, such a cool outfit. Your chainmail vest is A-MAZING!! love the bag!! LOVE this, you are so pretty! the chain mail vest is amazing and I've got to check out your youtube vids! I'm so so in love with high waisted riding pants but jeez the AA ones are so expensive ! I love it! And that chain top is sooooooooooo cool! Glad you chose the red creepers! Woahh I love everything about this outfit! You look awesome. The chainmail vest is amazing! Also love the colour coordination. Your voice was totally unexpected for me, but I have no idea what I thought you'd sound like haha. I've subscribed anyway :) Love your chainmail vest by the way. And I love the first outfit youtube video! beautiful! you have such an beautiful style! so cute, totallly love those shoes! Only just found your blog but I love your style - it's a little like mine. 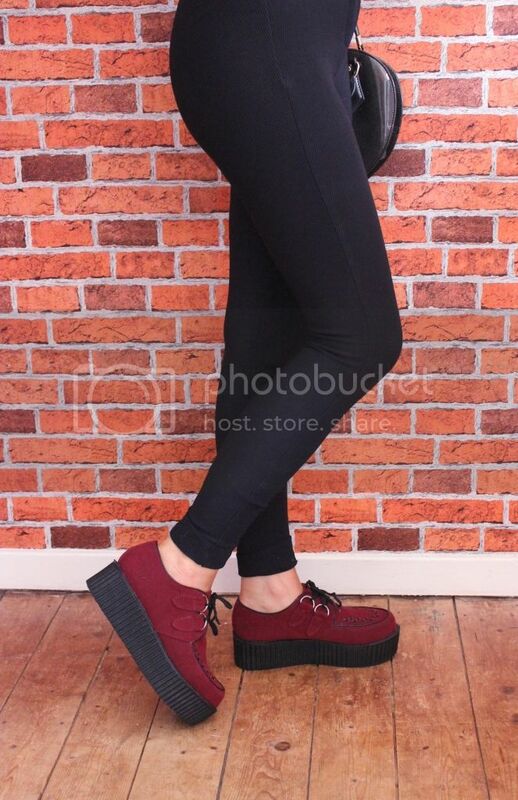 I just won those creepers on Ebay last night...can't wait to wear them. Love the body chain ...didnt realise it was jewellery at first. I have a wardrobe full of fashion wedge sneakers. When I say fashion shoes, I mean that at some point in my life they were in fashion. Mother’s a possibly the best gift after the god. Every year, a singular day is devoted near the mother. In fact, the solitary resolution of this blog is to request a happy mothers day quotes to all those loving and caring mothers who have assisted in nurturing a child’s future.